Should you save your child's cord blood? Cord blood is what remains in the vessels of the placenta and the portion of the umbilical cord still attached to it after birth. (Parenting.com) -- Is saving your child's cord blood a wise investment for future stem cell therapy? It wasn't until my second pregnancy that a brochure touting the benefits of umbilical cord blood banking caught my eye. It made a convincing case for giving my baby this potentially lifesaving health insurance should he develop a serious illness like cancer. I dialed the number and signed up with a private cord blood storage bank on the spot. I learned that in addition to the initial costs, I'll be paying an annual storage fee until my son is 18. Cord blood is what remains in the vessels of the placenta and the portion of the umbilical cord still attached to it after birth. 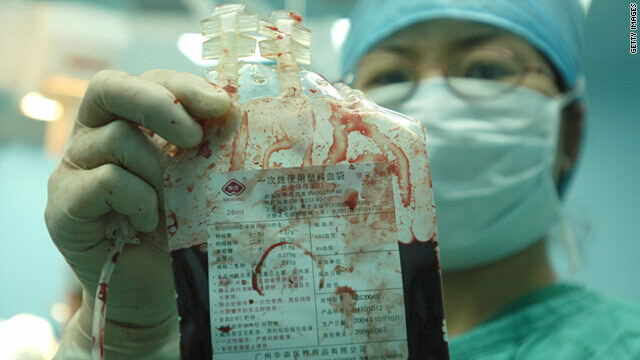 It's rich in blood-forming cells that can be used in transplants for patients with leukemia, lymphoma and many other life-threatening diseases. Each private cord blood bank charges different fees. A recent study from the University of California, San Francisco, estimates the total average cost to be $3,620, which includes initial banking and storage for 20 years, at which point users must decide to either continue paying storage fees or donate or discard the cord blood. The American Academy of Pediatrics (AAP) estimates the chances of a child needing her own cord blood stem cells in the future to be about one in 200,000. "That means it's a very rare event for a family to bank cord blood and then actually use it," says Steven Joffe M.D.,associate professor of pediatrics at Harvard Medical School. But who's to say that one family won't be yours? The AAP recommends discussing the issue with your doctor and storing cord blood at a private bank only if a family has knowledge of a sibling with a condition that could benefit from transplantation. Otherwise, families are encouraged to donate their newborn's cord blood to a public bank (if accessible in the area) for free, much like donating blood or an organ; in other words, the donated unit is not reserved for the family who provided it. Find a list of participating hospitals that work with public cord blood banks at bethematch.org. If you do decide to store or donate your baby's cord blood, you should notify the bank or hospital by at least the 34th week of your pregnancy. The National Marrow Donor Program offers the related Donor Cord Blood Program, which allows eligible families to store cord blood at no cost to treat an affected sibling. A fee is only applied when the unit is used. Visit marrow.org/relatedcord for more information.